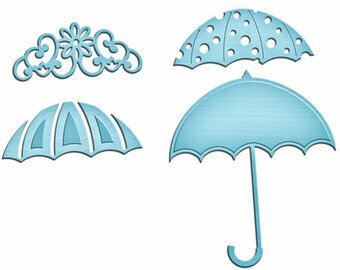 Customize the perfect umbrella for any occasion, such as a baby shower or just singing in the rain! A great trio collection with Rainy Day and Wellies sets. Spellbinders Shapeabilities cut, emboss and stencil with a single die template. Approximate Die Template Sizes: Floral Insert: 1 3/4" x 3/4", Panel Insert: 1 7/8" x 7/8", Polka Dot Insert: 2" x 3/4", Umbrella: 2 1/4" x 2 3/4".